Angela’s note: Our friend on tour Selena Moshell is a true adventurer. Call it wanderlust, call it intrepid-ness, call it pluck, call it what you want — but wherever the Lion King takes us, she is grabbing the bull by its horns (or in this case, the balloon by its flaps) and taking in the most unique experiences each city has to offer. 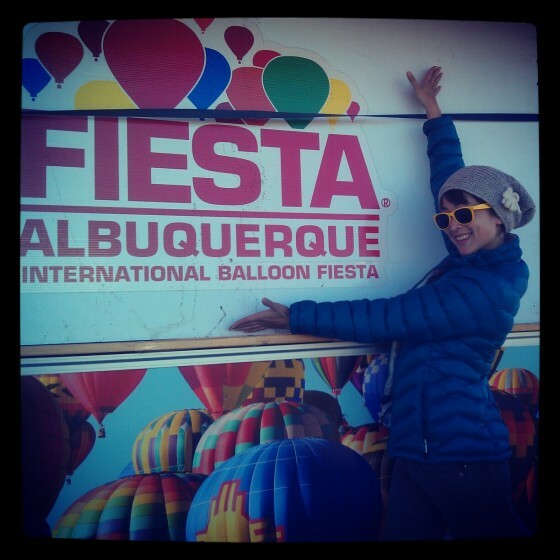 In Albuquerque, we lived vicariously through her as she actually got to go up in a hot air balloon at the International Balloon Fiesta and lived to tell about it. Dripping with envy but hungering for every last detail, we asked her to share her amazing day with us. Selena is a dancer, professional tourist, and collector of life experiences. She aspires to host television someday, but until then, hosts her own blog/web adventure show at Green Means Go Travel Show, where you can see her say YES! to everything that comes her way. Hello to the “3 for the Road” readers! 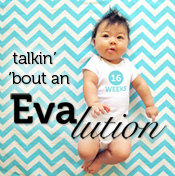 I am so honored to contribute to my dear friends Angela and Mike’s (and Max’s!) 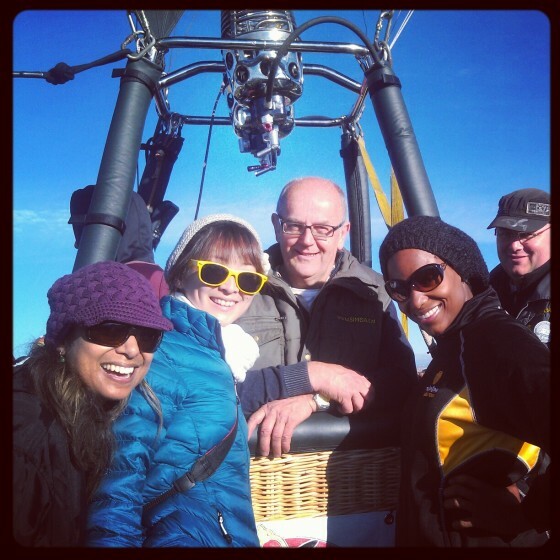 blog about my experience 3,000 feet in the air above Albuquerque… but I’m getting ahead of myself. The first thing you gotta know is that I’m Selena Moshell, a dancer on the Lion King Gazelle tour with Mike. Second thing you have to know about me, is that I am a big proponent of the word “YES!” I pretty much say it all the time, with little-to-no “no’s” sprinkled between. 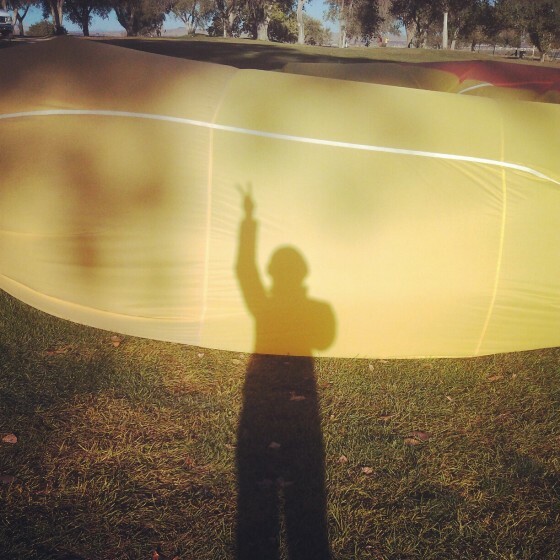 That’s how I’ve found myself in some pretty interesting situations — and this time, it was me velcro-ing 75 hot air balloon flaps together at 5:30 am…. 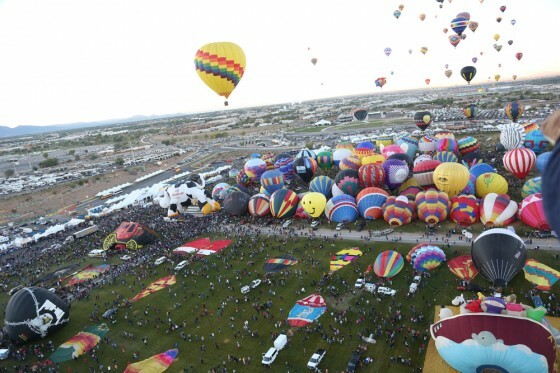 So apparently Albuquerque is the home to the most photographed event in the world, the International Balloon Fiesta! I had heard rumors of this going on, but mostly for me that meant that housing was extremely difficult to find for that city. 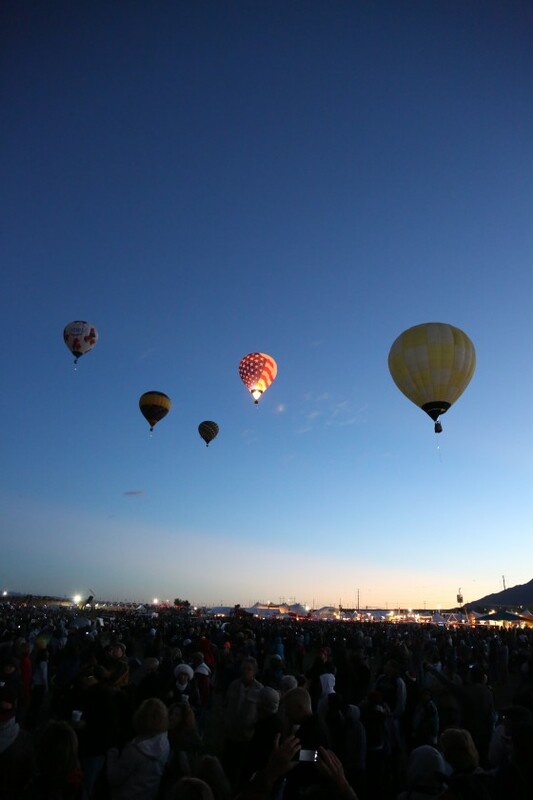 I heard from my roommates about an opportunity to ‘chase balloons.’ I wasn’t sure what that entirely meant, but sticking to my “YES!” life-mantra, I set out at the ridiculous hour of 6:00 am to Balloon Fiesta Park. First flights of the day! The first morning was more of a fact-finding mission. I poked around here and there until I found the ‘chase crew office,’ where people were recruited to chase balloons. Apparently, it works like this: hundreds of balloonist and their giant balloons show up from all over the world. 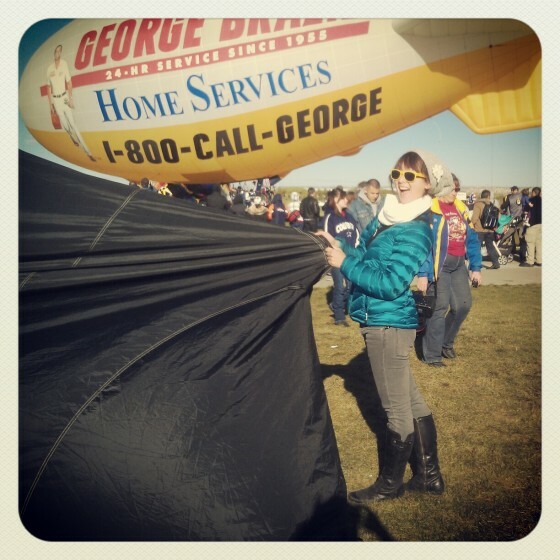 Some come equipped with their own crews, manning the inflation, take off, landing, and re-packing of said giant balloon. 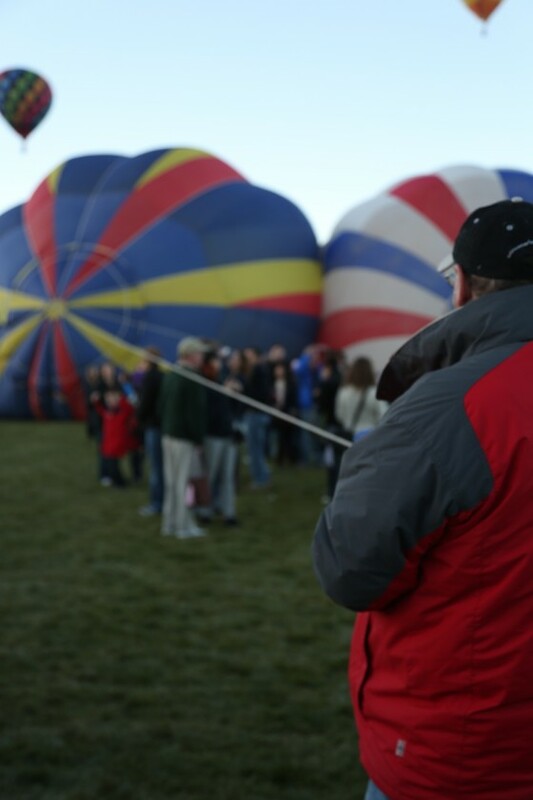 The vast majority of teams, however, come sans crew and rely on local volunteers to man their balloons. I promptly signed up for the next morning, watched the balloons glow in the early morning light, and went back home to sleep a few more hours. I reported bright and early the next day with my friends Kendra Moore and Tryphena Wade, a dance captain and Sarabi on the tour. 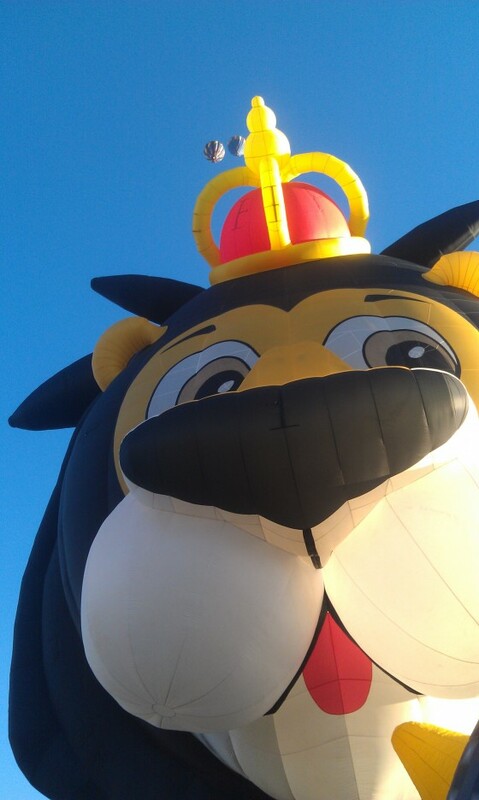 After learning of our Lion King associations, we were assigned to the Simba balloon, and the irony was not lost on us. This “Simba” however, was not the copyrighted Disney-face we were used to- in fact, this balloon was based in Brussles, Belgium and was purchased in Africa, where the word “Simba” literally translates to “Lion.” And therefore, any Lion could be named, naturally, Simba! 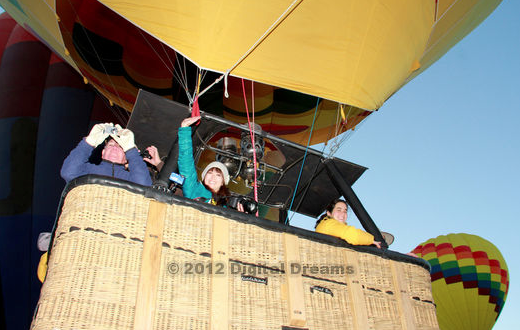 We met the crew that was made up of a family that had manned the balloon for years. They were super welcoming and quickly trained us on the finer points of balloon velcro-ing. We had picked a tricky balloon to crew. This particular balloon wasn’t the normal round shape. It was literally the shape of a lion’s head, complete with crown. (He IS the king of the jungle, after all!) 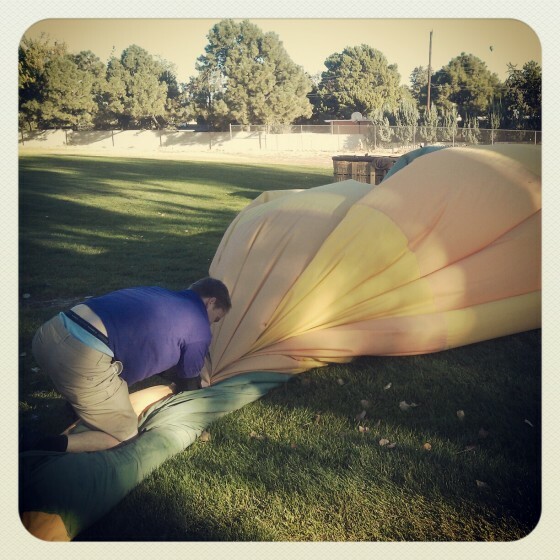 Since the balloon had a unique shape, there were over 75 different flaps for us to find and fasten before the balloon could fully inflate. Me and the underside of the Simba balloon, mid-inflation! First, the balloon was laid out flat, and cold air was pumped in via an oversized fan. 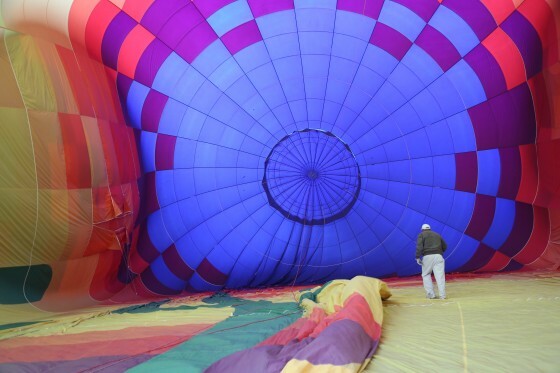 As the balloon inflated, we scurried around the brown form taking shape, listening for the familiar rush of air escaping from an open flap and quickly securing it shut. 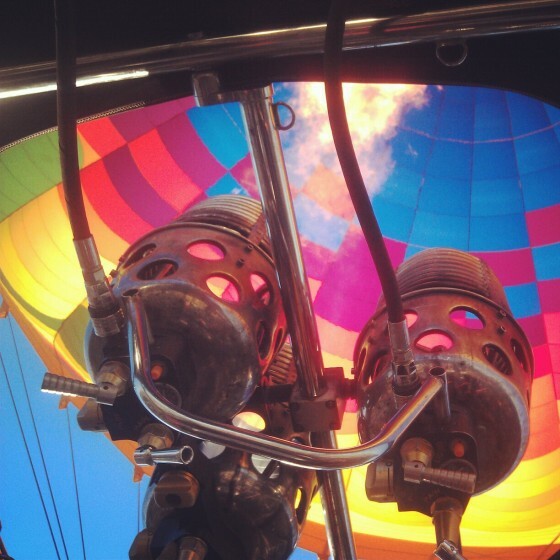 After the balloon was halfway inflated, the pilot turned on the burners, heating the air, which caused the balloon to rise. If we don’t have most of the flaps closed at this point, we are in trouble, checked and double-checked for errant flaps. 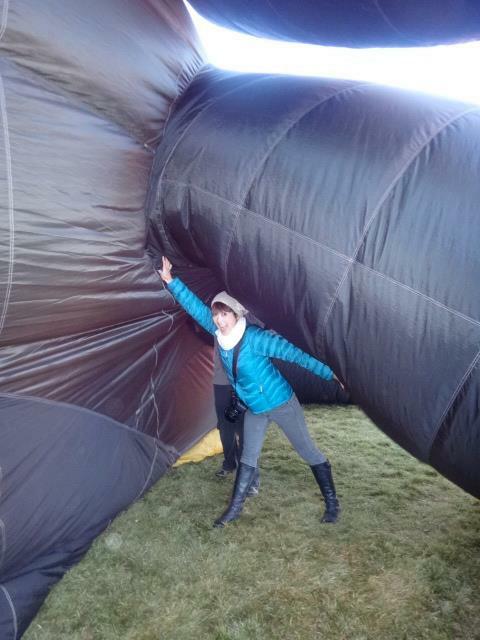 Finally, the balloon was inflated, and we stood back to appreciate the flap-finding work we had accomplished. The Simba balloon didn’t fly that day due to the wind direction, though. The captain decided that it was too risky to try to clear some power lines that were close by, but a few other balloons risked it and paid the price. At least one balloon a day was getting caught on trees, telephone lines, and in the worst case, power lines. Simba, in his inflated glory! 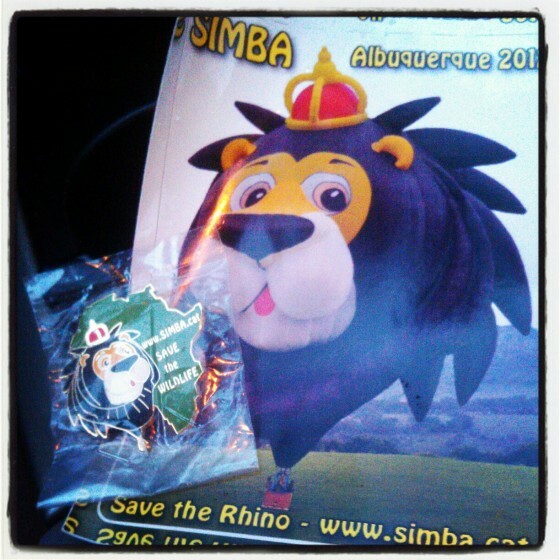 The pin and sticker from the Simba balloon. Apparently pins are a popular trade item in the ballooning world. Irony? I think so. The captain checking out the inside of the balloon! After the balloon was inflated (it was round and flap-less, making inflation a lot quicker than the Simba balloon!) we all piled in and got ready for our flight. I had a few friends on the ground to wave to as I ascended into the clouds, which was really great. We slowly left the ground, and I didn’t really know what to expect. I had flown in planes too many times to count, but that’s different — you’re in a speeding vehicle — the aerodynamics made sense to my brain. The fact that I was standing still in a wicker basked with 12 other people and slowly beginning to levitate messed with my head a little bit. It was a bit surreal to see my friends get smaller and smaller much more gradually than an airplane ride, and hear them clear as day for several minutes as we left the ground, calling up to us. We floated where the wind took us, up, up and away from the grounds, which gave us some spectacular views of all 300+ balloons ascending around us. It became incredibly quiet and peaceful at a certain point, when we were too far to hear the hubbub and excitement of the fair grounds. The sun peeked out from behind the mountains, warming the chilly air at 3,000 feet quickly. The passengers around me gradually fell silent as we watched the sun crest over the ridge, and I inhaled the cold, crisp air as I tried to experience the moment fully. 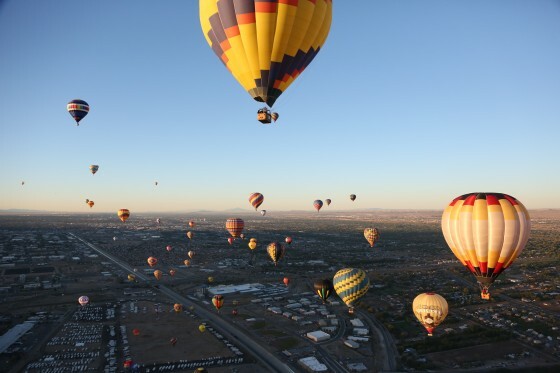 It was a meditative, surreal, beautiful time, floating through the air above Albuquerque. The Fiesta grounds, from above! The really exciting part about ballooning (or frightening, depending on how you see it) is that there is no steering the balloon whatsoever. The most control you can exert is up or down, and the pilot learns to ride the air currents in the direction he or she wishes to fly. As a result, we saw a few balloons landing in interesting places, like medians of highways and parking lots. As we descended, the pilot warned us to bend our knees and turn away from the direction in which we were traveling. That way, if we were to tumble out of the basket, our beautiful faces would be spared. At least that’s what he told us. I think the actual reason is seeing the ground race up at us is unsettling… At any rate, we braced ourselves for impact, and it was definitely a hard landing. 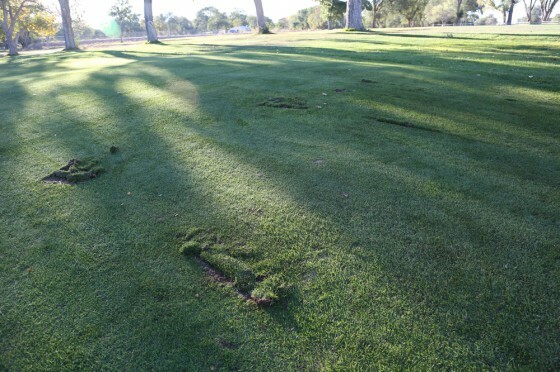 (Apparently they all are in ballooning…) The basket hitting the ground was incredibly loud, and we dug out two pretty impressive divots in the course. The golf course’s greens keeper who came out to make sure we were ok seemed fine with it, though, saying “We’re in Albuquerque, we’re used to this.” I found it amusing that he’s just used to 15 tourists dropping from the sky once a year on his property, but grateful he wasn’t upset about the new small dirt trap our basket had created in the middle of his fairway…. We watched our chase crew roll up our balloon, piled into the chase van, and went back to the launching ground for the traditional champagne toast, post-flight. All in all, it was an amazing experience, especially the absolute peace and quiet that we ascended into, up in the clouds. It was like entering a sacred space, rising up with the sun, high above a bustling city as everyone is starting their day. Check out more of Selena’s adventures at www.greenmeansgotravelshow.com! DO YOU WEAR PARACHUTES OR ANYTHINGN IN CASE SOMETHING STOPS THE BALLOON WHEN ITS UP IN THE AIR????? HOLY SCHNIKES!!! You all get to go to the coolest places! Thanks for sharing these adventures! I’ve always wanted to go up in one of those balloons – was it expensive?? Steve – Thank you ! Angelique- haha, nope, no parachutes! Michael- Thank you so much! Kiran- For the ride during the Balloon Fiesta it was a bit pricey, at almost $400, but during any other time of the year it’s more reasonable, around $150-$200. But honestly, it was worth every penny!